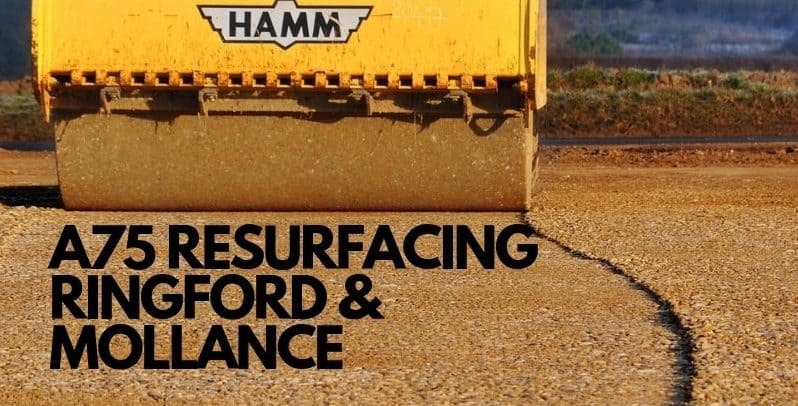 Scotland TranServ, on behalf of Transport Scotland will combine two resurfacing schemes on the A75 at Ringford and Mollance, between Castle Douglas and Gatehouse of Fleet Starting on Tuesday the 23rd of April Until Saturday 4th of May. In order to complete this £620k investment as quickly as possible, it will be necessary to implement daytime convoy systems between the 23rd April and 4th May. “This is a significant resurfacing programme to improve nearly 2km of this busy trunk road connecting the Irish ferry port of Cairnryan with Scotland’s central belt and the north of England. In order to keep disruption to a minimum for commuters, businesses and freight traffic alike, Scotland TranServ will deliver these trunk road investments under daytime convoy.